After Chittor was sacked for the last time (1568), Maharana UDAI SINGH II established his new capital 3 km. from Ahar, naming it Udaipur. 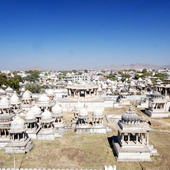 Today, Ahar is the Mewar royal family's mahasati (cremation site), which is near the museum. In 1615, Maharana AMAR SINGH I (1597-1620) was the first Maharana of Mewar ever to die in Udaipur. (His grandfather, Maharana UDAI SINGH II died in GOGUNDA, and his father, PRATAP SINGH I, died in CHAVAND). Amar Singh was also the first Maharana to be cremated at Ahar. The following year, Amar's young son and successor, Karan, erected a magnificent marble chhatri (cenotaph; literally umbrella) in memory of his father. Still to be seen, it has a four-faced statue in the centre and friezes at the base, depicting his numerous ranis (queens) who committed SATI at his cremation (in accordance with custom, they died with him on his funeral pyre). Thus Ahar became the new cremation ground of Maharanas, members of their families and certain of the nobility, and also became the site for their commemorative cenotaphs. It is graced by memorial cenotaphs; handsome columns raised on lofty terraces support vaulted roofs, the architraves of which are enormous single blocks. 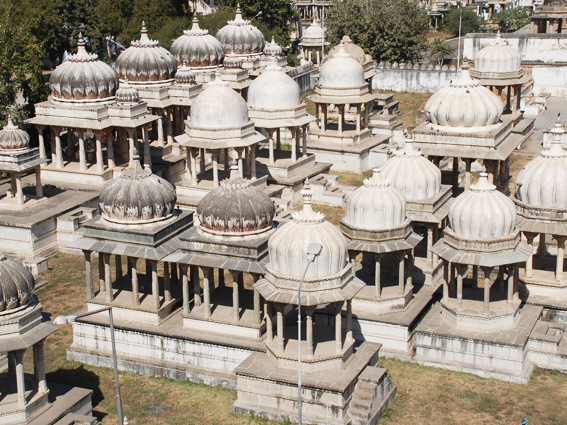 All are constructed of white marble from the quarries of RAJNAGAR and KANKROLI north of Udaipur. 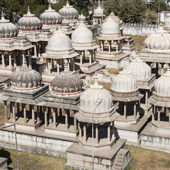 Nineteen Maharanas who ruled and died in Udaipur have cenotaphs here, including SWAROOP SINGH, SHAMBHU SINGH, SAJJAN SINGH, FATEH SINGH, BHUPAL SINGH, and BHAGWAT SINGH MEWAR. Another fine specimen is the cenotaph of SANGRAM SINGH II who, in 1734, was cremated with twenty-one wives. It has a fifty-six pillared portico with an octagonal dome in the centre, supported by eight small pillars. 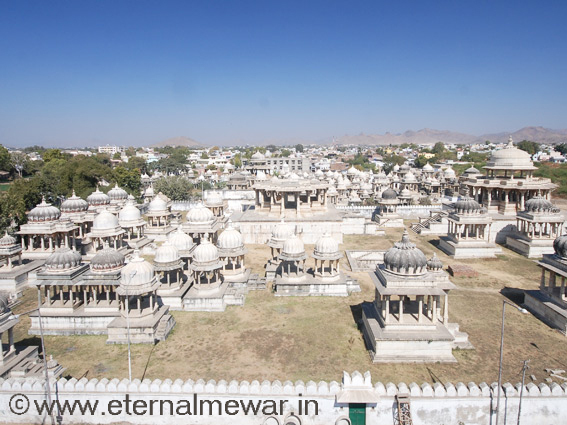 In the late 1990s, to preserve this important area of Mewar heritage, SHRIJI ARVIND SINGH MEWAR OF UDAIPUR began restoring his ancestors' cenotaphs and they are now a splendid tourist attraction.